In this week's post, I'm changing it up in honour of my furry friends Ava and Zoey. They recently celebrated their eighth and fifth birthday respectively. 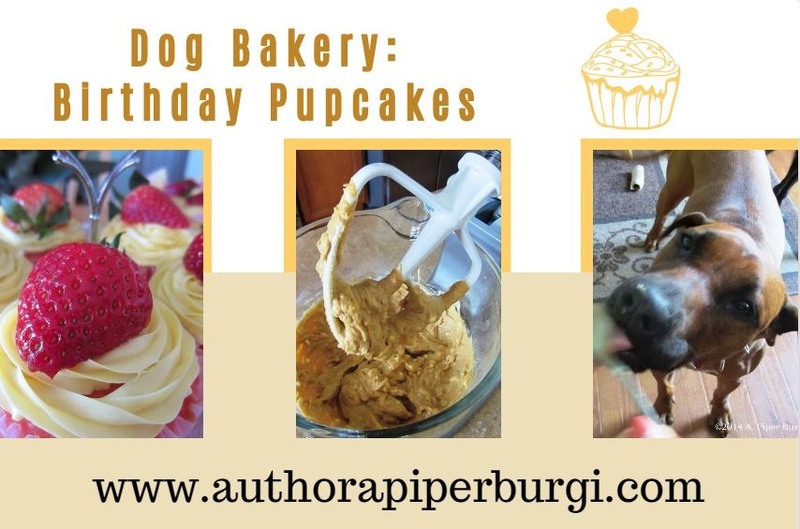 As it has been our tradition for many years with our current furry children as well as our last two, Lana and Darren, I baked some yummy pupcakes to help us celebrate. While the baked goods were made for our furry companions, they can also be consumed by humans, although they might not be to their liking due to the lack of sugars. This recipe and others can also be found in my book, Living with Canine Epilepsy. 10. For the frosting, beat heavy whipping cream until you reach the desired consistency. 11. Once pupcakes have cooled, pipe whipped heavy cream onto each and garnish with fresh fruit - I chose strawberries. This recipe yields six pupcakes. Notes: Since neither of our dogs show any signs of food allergies, we don't think twice about the use of wheat flour for this recipe. However, this ingredient can easily be replaced with gluten-free options, such as coconut flour or rice flour. Just keep in mind that some of those gluten-free options do not absorb liquids as well as their ordinary counterpart, so you may need to adjust the amount of flour. I added some beet juice to the cake batter and carrot juice to the whipped cream to give the pupcakes and the topping colour.